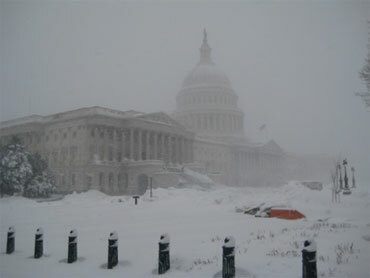 Conservative congressmen are using Washington's serious snow storm (known as "snowmageddon" or "snowpocalypse") to mock those who say the government should act to curb global warming, and at least one Democrat says the storm could actually set back progress on an energy and climate bill. Sen. Jim DeMint (R-S.C.) took to the social networking site Twitter to mock former Vice President Al Gore over the storm: "It's going to keep snowing in DC until Al Gore cries 'uncle,'" he tweeted yesterday. Sen. Jim Inhofe (R-Okla.), the top Republican on the Senate Environment and Public Works Committee, also got in on the fun. He and his family built an igloo in Washington and adorned it with cardboard signs reading "Al Gore's new home" and "Honk if you [heart] global warming." Inhofe is one of the loudest skeptics in Washington of global warming and traveled to the United Nations climate change summit in Copenhagen in December to make his point. The liberal blog Think Progress challenged Inhofe's joking attitude, reporting that, "In reality, winter snows do not invalidate the reality that the planet just experienced the hottest decade on record. Scientists have been warning for decades that global warming would increase the severity of winter storms." Meanwhile, the magazine Mother Jones reported earlier that the Virginia Republican party has capitalized on the snow by running an ad against Democratic Reps. Rick Boucher and Tom Periello for supporting cap-and-trade legislation. The ad blasted the Democrats for voting to "kill tens of thousands of Virginia jobs just to stop [global warming]." It urges viewers to call the legislators and "and tell them how much global warming you get this weekend. Maybe they'll come help you shovel." Democratic senators are conceding that the chances of passing a comprehensive climate and energy bill, like the House passed last year, are slim, the Hill reports. Sen. Jeff Bingaman (D-N.M.), chairman of the Energy and Natural Resources Committee, told the newspaper the storm is not helping. "It makes it more challenging for folks not taking time to review the scientific arguments," he said. "People see the world around them and they extrapolate." President Obama, meanwhile, said yesterday that he remains an "eternal optimist" and expects Congress to reach a consensus on an energy bill. He suggested there should be a bipartisan agreement to promote both alternative energy sources and fossil fuels. He made no mention of a cap-and-trade system, which would enable industries to buy and trade permits that allow them to emit certain levels of carbon.